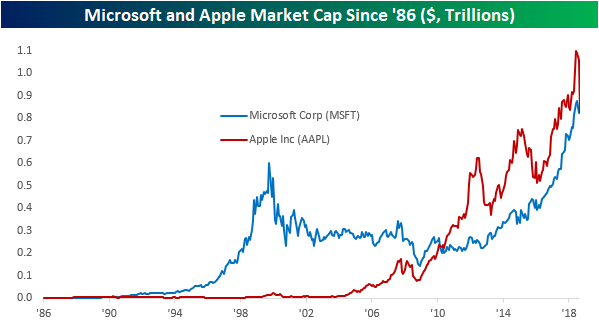 Below is a chart comparing the market caps of Apple (AAPL) and Microsoft (MSFT) going back to 1986. While Microsoft (MSFT) dominated Apple (AAPL) during the 80s and 90s, Steve Jobs finally one-upped Bill Gates with the release of the iPod and then the iPhone in the mid-2000s. 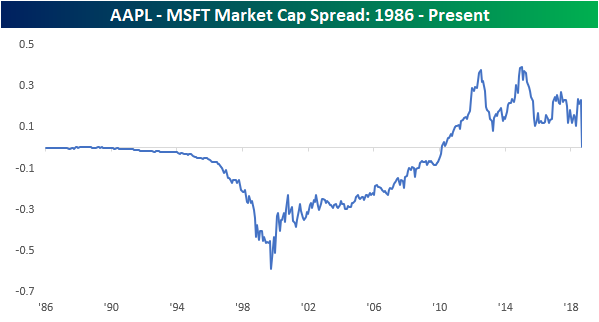 After peaking in market cap at the highs of the Dot Com bubble in 2000, MSFT began a slow drift lower in size before finally putting in a bottom at the lows of the Financial Crisis. At the same time, Apple saw its market cap skyrocket higher and higher as the iPhone took over the world. While MSFT began to see a pick-up in market cap again in the early 2010s, it couldn’t keep up with Apple. Over the last few years, however, Microsoft has turned into a Tech juggernaut again as its Windows 365 “cloud subscription” model has worked to perfection. You can see in the chart that MSFT’s market cap has been rising nearly as quickly as Apple’s market cap since 2016. Below is a look at the spread between the two market caps going back to 1986. While Apple maintained a healthy lead in size over the past few years, the company’s recent swan dive has left it only marginally larger than Microsoft. As of this morning, Apple’s market cap stands at $821 billion, while Microsoft is worth $816 billion!